With very limited sewing skills Pamela enrolled for a class and began her first quilt about which she talks here. 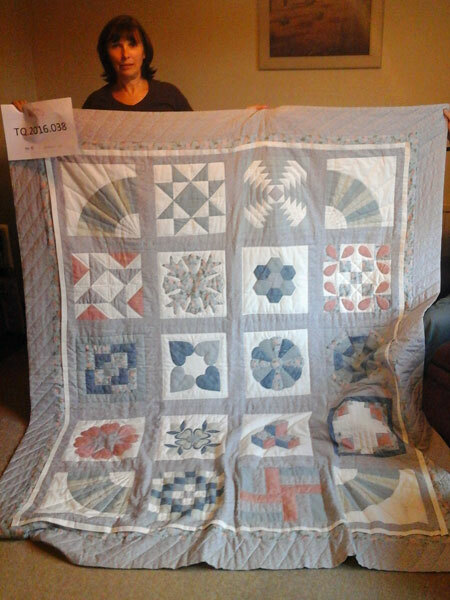 Her quilting skills evolved and so did friendships, and she and a group of fellow quilters have continued to meet for almost 20 years. 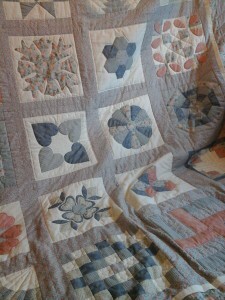 Many of the quilts she has made have been for family members. Some have been created using their clothing. Pamela speaks of her fondness for triangles and for her grandmother’s sewing machine and tells how much she enjoyed attending quilt shows at Chilford. Her interest in the history and social implications of quilting is made clear. Bridget Buchan [BB]: Okay just before we start I need to say that I am with Pamela Soper whose number is TQ.2016.38. It’s October the 19th 2016 and we’re in Pamela’s house in Soham in Cambridgeshire. And thank you very much Pamela. Pamela Soper [PS]: You’re welcome. BB: You’ve brought [chuckles]. You’ve let me come here and you’re showing me your beautiful quilt which we’ve left crumpled up on the floor while we’ve been taking about other things. BB: So to begin with desc, tell us about this quilt. PS: Okay. This quilt came about because um my sewing limits was sewing a button onto my husband’s shirt and um my mother even thought that I did a very bad job of that and then um a friend who I was working with at the time had seen advertised a one-off class to make a cushion which involved a appliqué on the front. And so we went along one evening in the winter it was and we went to Mildenhall and we were shown how to appliqué hearts onto literally just a 12 by 12 square of fabric and, and it was needle turn appliqué and we made this cushion and, and that was that really. And then in the new year the place that we’d gone for the, the lesson that night were, the lady was advertising, she going to start doing quilting classes and bearing in mind my sewing was just appalling and very limited and she was going to do this quilting class that took, it was to go indefinitely really, you just went along and you would be making samples, to make up a sample quilt and it was up to you how long you stayed and how involved you were and, you know, and there you went. So that’s how it all started. So a friend and I went and then another friend joined us and, and so I started to learn how to sew much to my mother’s shock [laughter] and out of it came a quilt for a double bed. PS: Well it’s, it’s very , the colour wise [coughing in background] it’s quite a cross maybe between a Cath Kidston and a Laura Ashley [laughter] with the colours and blue is my favourite colour, so blue plays heavily in it. Some of the samples are geometric and others are much more freestyle and I am a little bit of a control freak and I love order [noise in background] and so the, the ones that are the more freestyle ones are the ones that um I found less comfortable to make [laughs]. And the ones that um involved triangles and so on [laughs] were much more pleasurable [laughs]. BB: Did you, where did you come buy the materials, the fabrics? Did you buy them all at once for it? BB: So which was the very first block you made? Can you remember? PS: Ooh, no no. The very first block I, I think the very first block was this one here. It’s four hearts that have been nee, needle point turn appliquéd on and then all the quilting on this quilt is hand quilted. None of it’s been machine quilted and um the inside of the hearts was being heavily appliquéd and it just follows the line around but then you get the texturing. It almost looks like it’s been stippled. [Interruption] also. BB: Was that the one from the cushion group? PS: Yes it was, yeah. And so we repeated that one there and it was, one of the reasons it was done was so that we could see the effect that quilting will have on the fabric and not just for holding it together but in itself it lends texture. So, so that was the one that we started with. My least favourite one which was one that we did, I think it was probably about month three. It wasn’t too far in and it’s a spider’s web which is [BB: Under your hand…] yes there it is, dreadful thing. It is the spider’s web and it’s, it’s a continual joke with all the girls that I learned to sew with because it, it took me all day to try and put it together from 10 o’clock in the morning until half four in the afternoon and still it was not quite right and it has been heavily pressed into shape [laughter] and I will, I’ve never made another nor will I [laughs]. And, and, and although it’s geometric and you’d think I would like it, I, I just struggled so much to get the points to be perfect and it just didn’t want to play and I hadn’t learned at that point about the stretching fabrics and being so careful about cutting on, and all the rest of it and so because I was obviously much of a novice and I was trying to do this more complicated panel that, oh it was just the bane of my life. I felt like a naughty child in school having to keep unpicking it and putting it back together, to the point of it almost frayed beyond it’s worth [inaudible]. Yeah it was a nightmare making that one. BB: So which was the favourite do you think? PS: Probably the flying geese and I’ve made that one, I’ve used flying geese several times since. Anything with triangles actually. I really enjoy triangles. So the flying geese, I liked that one. PS: And I liked the effect, it was neat and tidy and I’ve, I’ve used it in longer borders and things. I also liked is that Ohio style, I’m not sure. BB: It might be. I can never remember which is which. :02 PS: There’s so many different styles but that, the one with the stars, again. It’s neat and tidy and but I really enjoyed putting those, the triangles and that together. The pineapple one was quite nice and I have actually used that on, made a quilt for my mother in law and, and I used the pineapple quilt design and on the pieces that were, I used this calico, every member of the family signed their name. PS: And so each family had a square and they had their name on there at some point. But my in-laws have very large families [laughs], so we needed a lot of space for them. BB: So how long did you spend making this particular quilt? PS: About two years. It involved, once a month we went to Mildenhall for a lesson and we, we had a block to do each month and we were also given a block to do for homework. So each month we would make two blocks, one in class, one for homework and obviously there were times when then [interruption]. BB: But the same block? PS: No, no you would have maybe like, I would maybe do the Dresden plate in the class and maybe the trip round the world would be my homework and we were given all the instructions and what have you. Obviously if you had any problems then we could either go over to the shop and she would help us or wait until next time or whatever. And there were times when we were on holiday or whatever and once all of the panels, all the blocks were made would obviously include quilting them as well as piecing them and then putting them together took quite some time with the sashing. BB: So it was quilt as you go? PS: Yes it was. Quilt as you go. Then join the blocks. BB: So was each block, each block is. PS: Each block was, was pieced. PS: And then yes, and then each one has sashing round it. PS: So it was, I, I think they’re 10 inch blocks and they had, and they’re made up to 12 inches with, with the sashing [interruption] round it but they were all, they were pieced then hand quilted, then joined and then the board was put on. BB: And you said that the group has gone on meeting? PS: Yes, not, not all of us but a small group of us who um became quite good friends. We have continued to meet once a month and at each others’ house, you know, we all take turns in hosting and we bring along our sewing projects or sometimes sewing, more sewing gets done than others [chuckles] and some months we like this month we’re going to go to Duxford, to the quilt exhibition there and you know, so that we won’t have our get together we’ll go there and get together. But, yes so that’s continued since then. So all this time we’ve, we’ve continued. BB: And that’s how long? PS: Well nearly 20 years. BB: Same group of people still [interruption] meeting up for 20 years. PS: And I had no idea it was 20 years until we were just working out the date and that’s how long, it’s amazing actually isn’t it? PS: When you think, and then my children are grown up and they were at school and doing teenagery things when, when we first started [coughs]. BB: And you’ve been talking about Jenny‘s shop in, in Mildenhall. Tell us something about Jenny’s shopping, Mildenhall. PS: Okay that’s, it was called the Colour Room, it’s no longer there unfortunately and Jenny ran it with her daughter Lucy. Lucy now I think designs fabrics for Moda but and so between the pair of them and another lady they ran the shops. Jenny did all the teaching. Lucy did help from time to time. She has a degree in textiles. I’m not quite sure the exact, you know degree as such, but and so we used to go over and meet over there. But her shop, it grew. It started off just upstairs part of a shop with a very small room for about six people to, you know, have a lesson in and two sewing machines and a small range of fabrics and then by the end of the two years that I’ve been going for the, making the quilt, she’d actually taken over the, both floors the downstairs and the upstairs. The upstairs then was made over for lessons. So a good dozen of us could get up there. We’d several sewing machines and ironing boards and goodness knows what, all the stuff that you need and downstairs was the shop with a huge selection of fabrics. BB: What was the shop called? Remind me. BB: And, of course, being in Mildenhall, though Jenny herself is very much a local woman isn’t she? BB: But being in Mildenhall there was the, there were plenty of Americans. PS: Absolutely. There, probably the class that I was in almost 50-50 Americans and, and British um, you know, would, would be at the lessons and a huge cross section of ages and um, you know, what we did for living and just it was a real mixture of people [interruption] and it was lovely for it, yeah. PS: Bit like a quilt. BB: Yep. And Jenny went on didn’t she, offering, even after the shop closed. BB: Offering her time to people and I don’t know whether [interruption]. BB: That Saturday group still runs. PS: [Coughs], I was talking one day to somebody who lives in Barton Mills about quilting and she was aware of Jenny and I think she was saying that she had been doing, not lessons as such, but had sort of organised a group of people, you know, like-minded sewing people who met once a month at, I suppose, the village hall. BB: Yeah. I used to go for a little while but that was quite a [interruption], quite a few years ago now. PS: Hmm yes. But I’ve not heard anything probably in the last couple of years. 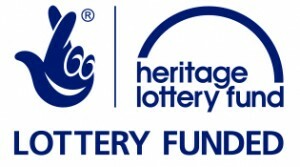 PS: So, yeah, and I haven’t seen Lucy either because when they had the shop they also, that was when Chilford Hall they had the quilt exhibitions at Twil, Chilford Hall and they always used to have a stand there and so we would catch up with Lucy. Jenny never used to be there but Lucy always was there and we used to catch up then. But it would be interesting to see if there was anything at Duxford bearing in mind, you know, this time and whether she would be there representing Moda in some way but. BB: Yeah. Interesting hearing you talk about Duxford because that’s another thing that’s quite significant twice a year to quilt, quilters around here. So tell us a bit about going to Duxford. Do you go every time it’s on? PS: When it was at Chilford we went every time it was on. Every, it was on twice a year spring and autumn and we would, you know, obviously in the autumn go and get our stashes for Christmas projects and in the Spring be all nice fresh colours and bright colours and that for the summer projects and but since it’s been at Duxford I have to say I have only been a couple of times. I think Chilford just had a lovely feel to it, just the setting and everything whereas Duxford not quite so. But it does allow a lot more people to have access to it so I can understand. But it has a big exhibition every year of quilts which are very inspirational and sometimes I suppose it’s a bit like going to the Ideal Home Exhibition and then you come home and feel very dissatisfied with your lot, don’t you? So it’s a bit like going there and seeing all these amazing quilts and thinking, ‘Ooh my poor sad old quilt’, you know. But, but equally you go there and you think, ‘I’d like to try and have a go at something like that’, and so it inspires you to try new things and, you know, do, do different techniques and what have you. And also as well as of the exhibition there, there’s all the stands selling everything from the batting to the threads to fabric and everything in between. So, so I know you can buy online and I know you can get it cheaper but, but you can’t realistically see colour or quality of fabric and there have been times when calico and things but I do prefer to buy it where you can see it and see the colours and [interruption]. BB: Do you find you have to leave your card at home or how do you manage? [Laughter] How do you manage the budgeting side? [Chuckles]. PS: Yes. I do usually take cash. Have you been talking to my husband? [Chuckles] I do usually take cash, however I do take my card. I’m quite sensible. but if I was there and I saw a, a fabric that I thought, I couldn’t, you know, that’s perfect for what I want and I need, you know, several metres of it then and I would hate to eat all my stash of money up and then I can’t buy all my small purchases so, yeah, I usually take, take the cash and try and be sensible. PS: I am most of the time [laughs]. BB: Very wise. So obviously from the way you’ve been talking then this wasn’t your only attempt at quilt making. [interruption] So you’ve gone on since. BB: So, so which, where, can you remember what you did next or can you roughly describe the path of how it went? PS: Yes I can. After, after this quilt it was a trip to Chilford actually and I bought a jelly roll and it was like lumberjack shirting in reds and navy blue of course and, and I made this quilt. It’s not quite a single bed size quilt but it’s not, not the big quilt and we use it on picnics and in the car, because I wanted this quilt, took me so long to make, that it’s, it, it’s not used an awful lot ‘cause there was so much effort that went into it and but since then all the quilts that I’ve made since then are all used a lot. And, and I made the red and blue, navy blue jelly roll one and that goes in the car and goes on picnics and what have you and then I made what is known by, known in our family as the sick quilt. It’s ne, never been vomited on and it is not the colour of but it’s used when people are sick and it’s made of brushed cottons in gingers and dark browns, black, it’s mostly checks and stripes. It’s a very manly one but I have a family of men so that’s why and, and it was backed with an old brush cotton sheet from one of their beds and it weighs a ton actually and I couldn’t actually quilt that one very well so I tied that one and used like the old leather buttons [interruption] and from duffel coats and things like that and, so the sick quilt hangs over the bannister upstairs and has been used the most. And then after that one I made one from, it was at the time when my sons were wearing really baggy flared jeans, the ones that sort of hang off your bottom, that kind and anyway they had gone through this phase and there were all these jeans that just seemed, you know, a shocking waste to be either throwing them all and nobody wanted them if you, you know, put them in charity bags or whatever. So I cut them up and I made sort of a boy girl quilt. One side is all the jeans and I included the pockets and things like that because we put napkins in the pockets because we take this one when we go on picnics with the lads actually. And so on one side we have things where you can put things in the pockets and on the other side it’s pink and white polka dots. It’s, [interruption] it’s the most girly thing on the other side. So, depending on whether I’m with my niece and my mum and my sisters or if I’m with the boys, then we either have the jeans side up or the, the pink side up but it has shocking pink rickrack going all the way round the edge of it so [laughs]. PS: Yeah. Yeah so and, and then after sort of the basic ones then my, my sisters asked if I would make a quilt for them and I made my youngest sister a quilt first which used my nephew’s baby grows and bits of clothing and it was a quilt that was all the different types of styles. So, well not all of them cause obviously there were loads of them but, like the prairie star and all, all the different blocks that you and it allowed me then to, because obviously they’re only small bits of fabric cause baby grows aren’t very big, so I could cut out these little triangles and so I made a quilt a bit bigger than a lap quilt with all of my nephew’s clothes and my, I don’t, well I did tell my sister I was making it but I don’t think she was, I don’t know what she was expecting but when I gave it to her it’s the first time as an adult I’ve seen her cry. [BB: Aah.] I know and my mum was really cross with me because [laughs] I’d upset her and I, anyway never mind. So and that quilt has been used and washed so much that it’s pretty much white actually. There’s hardly any colour in the fabric and it’s really worn and much loved. PS: Yes. My middle, my, the middle sister, she has a daughter, my niece, and so much, much younger than my nephew and so several years later I’ve made one for my niece, well for my sister actually because my sister won’t let my niece touch hers and hers is over a chair in pristine condition. It’s never been used. It’s looked at [chuckles] and, so very different sisters and but equally loved but just, you know, you’re not allowed to touch it [laughs]. BB: So it sounds like you’ve been much more motivated by making quilts for specific family members with a real, with a purpose like a picnic or a [interruption] then, then ever by the, that the, the, the techniques and the skills are secondary to you. PS: Yes probably. Yes probably. Of, they’ve been made like you say for family members or for reasons and in making them I’ve tried to try something different in different ones. But obviously when I was making them with clothing that, I, you couldn’t, I couldn’t afford to mess it up. So I had to stay within my comfort zone there but, but even so I’ve tried to do different things, you know, and yeah. But they, they are, they are, they are mostly used for, they are usually made for, for family members. Well in fact I’ve just finished making another jelly roll one and it’s from the shirts of both my boys and, I, I have twin sons and they are very close and one son in the New Year is possibly going to the Middle East for a two year tenure working and the other son is being very stoic about it. And when he saw that I had a whole pile of their old shirts in the cupboard he, he wondered why. And I said ‘Well at some point I, I thought might turn them into a quilt’, because they’re all shades of blues and bearing in mind I have this blue obsession. I had intended really for them for myself but that wasn’t to be and I cut them in a jelly roll style to see just how much I could get out of it and actually the quilt has come out, six and a half foot by six and a half foot so it’s come out quite a big quilt and, I’ve, and it’s made with the, both of their shirts. So, it will be something for the one, for the twin who’s staying here of his brother’s and. So anyway, I’ve made that into a quilt which he doesn’t know about and he’s having, his will be part of his Christmas present. So. BB: So yeah very much more, ‘cause I was, that’s what I was sort of thinking, you’re motivated by family situations. BB: And you’ve never been down the competition line or. PS: Oh my, no. absolutely not. I’d be mortified. I, I, it’s, it, it just wouldn’t be of that standard. I wouldn’t, no, no. I don’t think that I could produce something worthy enough to be hanging anywhere other than over a bed in my house [chuckles]. BB: Well I think your stuff is just as lovely anything else I’ve ever seen. PS: Oh, bless you, thank you. BB: So, what would you say quilting actually means to you? What, what, what in your life what part is it? PS: I like the creative side of it. I do like creative things in general whether it’s cooking or sewing or anything really. And in the process of being, it allows me to be creative and at the same time productive. I think I carry a big guilt thing around with me that if I’m sat doing something I really enjoy I should be making it worthwhile. So [interruption] but it’s a pleasurable worthwhile. So I suppose maybe that’s why I tend to be making quilts for purposes rather than just because I really fancy. I think the day that, you know, I’ve changed will be the day that I make a red and white quilt because I handcraft my red and white quilt but I’ve never made one and, and that will be just a real indulgence quilt. [BB laughs]. So if you see me with red and white fabric, Bridget, you know [laughs]. BB: Sounds a good idea. BB: Yes. 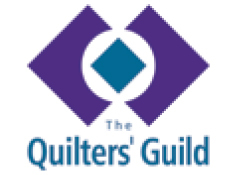 So I don’t know, well you can say a bit more about what does quilting mean for you? Where does it, you said you never done any sewing at all before you did this. PS: No I hadn’t. I mean when, when I showed my mother the quilt that I’d made, well, she didn’t believe me to be honest and..
BB: Did you have a sewing machine yourself at that stage? But it’s, you know a good old strong [interruption] quilt. But it, it just, it’s a very social thing quilting. When I’ve done it with friends most of the time and we share ideas and we also, we’ve seen our children grow up making quilts and so problems have been discussed and when my friend found out that she was going to be a grandma and she never ever thought she was gonna be a grandma, it was all shared and excited and when we were at out quilting group and, and I think as well when you’re quilting, although for one reason or another I can’t sit and quilt for hours on end like I used to. When you’re doing it I suppose it might be like that with other crafts or artistic things, you get lost in the moment and it’s very therapeutic. And completely de-stressing, except if you’re making a spider’s block [interruption], spider’s web block. That’s the only time I can honestly say I’ve been stressed making any kind of quilt was that one block. But as they rightly pointed out to me that it had to be incorporated into the quilt because it would then show that my quilt is not perfect. 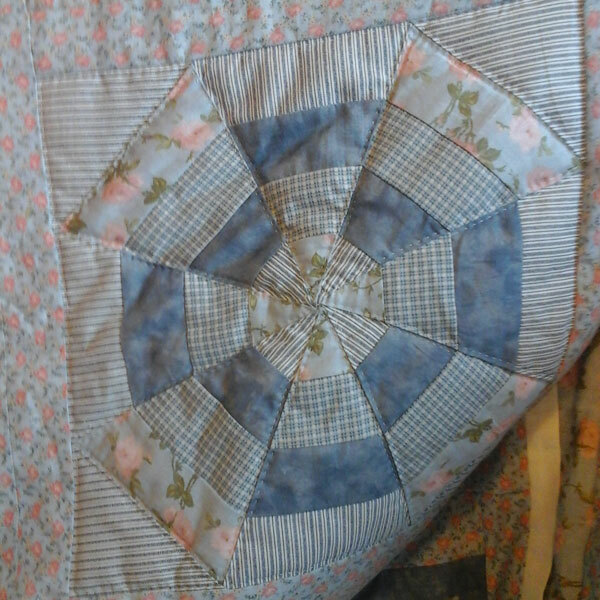 So, my quilt was very not, it’s, definitely perfect but particularly made so by this spider’s web blob, block. But, yes, so I found it very therapeutic over the years. BB: Yes. So though you, you very much root your quilting in sort of practical and family stuff and but you also, I mean you dropped several names into our conversation, you obviously keep up with the magazines and the YouTubes and the Pinterests and. PS: Well I’m a really, I, I like history and so I really am fascinated by where all these come from [chatter] and the stories behind the blocks and there’s, and so what starts out as maybe I might see a pattern in a book or in a magazine or something that I like and then I’ll maybe either work out how to make it or find a pattern for whatever. I’m fascinated by the stories that come from them and so over the years I’ve, my husband is a, a sweetheart and he knows how much I enjoy my quilting and so he’s bought me books over the years. He’s, with the history of quilting that to it more than actually how to make one because, you know, but he, I don’t think you do there. But and so I’ve, I’ve read about the history of things and the social implication of quilts and that especially when the slave trade in America and how they used the quilts there, you know, to pass on messages as to where the next safe house would be on their route north. Although I know that’s sometimes disputed as to whether that actually happened or not. But so yeah I, I really do like the, the social history behind all the quilting and so that part of it I enjoy as well. So, I, you know, had books on that and magazines and not so much magazines anymore. I suppose the internet has maybe removed that a bit when you can find things online. I have actually found a lovely lady who is in America and quilts and on a holiday to America last year, I did actually manage to meet her and we, we still keep, we keep in touch but her quilting is very different to mine. It’s more, hers is much more based on Shaker colours. It’s a very dark and plain and she uses a lot of purple and anybody who knows me knows I have a real passionate dislike for purple. So although we are probably poles apart as far as quilting styles and things go, we both have a passion for it and in that you share and so [interruption] so, you know, we have that in common. But, yes so, yeah. BB: I think possibly we’re nearly there. I mean if I said what is it, why is quilt making an important part of your life or is it an important part of your life and what, what would be life be like without it? How would you answer? PS: Well I can answer insofar as, as you know, a couple of years ago I found that there were a lot of things I couldn’t do because of a medical condition that I have and one of the things I was told was that it would probably be best if I didn’t quilt because, because it aggravates things. And to be honest it made, it made me cry and I thought I can’t imagine not, I can’t imagine not indulging in the creative bit and also the peacefulness that it gives you sitting and doing it. The, the relaxation and, and so despite being told not to, I carried on doing it [laughs] but I just did it in very small amounts and not too often. And, and gradually I’ve been able to increase it but still I can’t do too much and if I do I know I have. So, but I, I wouldn’t not quilt to be honest. PS: Unless it was, you know. BB: So you went as far as risking your health really. PS: Well yes but, but to be honest though I think in, as, as far as aggravating my condition yes but in not doing it I think that would’ve left me maybe slightly depressed and so actually did I damage health by doing it? PS: So I, I don’t know. I think there’s, there’s a case for and a case against there. PS: But I, I definitely think, well I, I, I can’t imagine not ever having some sewing project on the go. I can’t, yeah. So I and I also have on the go a grandmother’s flower garden quilt which is I am piecing completely by hand and then I will hand, I mean up to now I’ve, I’ve always machine sewn the blocks or [interruption] whatever quilt I’m making and then hand quilted. I’ve never machine quilted either. I’ve always hand quilted. I really enjoy that process too. That’s very rhythmic and therapeutic and, and but this I’m actually hand piecing and it’s using up all my scraps of all my quilts and also I’m begging or filching from friends all their bits and scraps because this quilt will have a, a story to it for all the different fabrics that I have. And what I’ve been doing I’ve been doing it over a number of years actually and I have a little bag that I take on holiday with me and so even when we’re away on holiday, wherever we are, whatever we’re doing, I take the hexagon templates and I’ve pre-cut the fabric, so I can just tack them and then sew them. And so far I have, I’m about two thirds of the way to a full size quilt. So. BB: What size are the hexagons? PS They are two inch, yes, yeah. I think it’s two inch. Yeah, there about. PS: … rather than joining all the flowers together. I know you can use a pale green maybe or whatever to assume grass or whatever but I, I, I think I’m a little bit of my control freak coming out again. I think I need it neat and orderly and the cream going through it [laughter]. I can’t have too much of a mess going on. BB: Yeah, no I, [chuckles] I’d go for calico too [laughter]. PS: One of the other things I did actually relating to holidays was the holiday that I spoke of earlier when we went to America last year and it was in the fall when we came back. I, I have a love of log cabin as well and the story obviously with the log cabin squares and I fished out all my bits of fabric and autumn being my favourite month of the year as well so I’ve, I started off making some log cabin blocks and with the full intention of making enough to have a tablecloth for my ta, my dining room table and because I can only do a small amount of sewing at any one time, I knew that if I wanted a tablecloth [chuckles] it was going to have to be several more autumns before I could put it on the table [laughter] and, and I didn’t want that and , so in the end my tablecloth became a table runner [laughs] and so with a nod to America and the fall and, so I made a log cabin table runner which is on the table now. BB: Well I think we should say thank you very much at that point. I’ll go and have a look at your log cabin table runner, we’ll drink a cup of tea and then we’ll take our photos. PS: Okay, thank you very much.